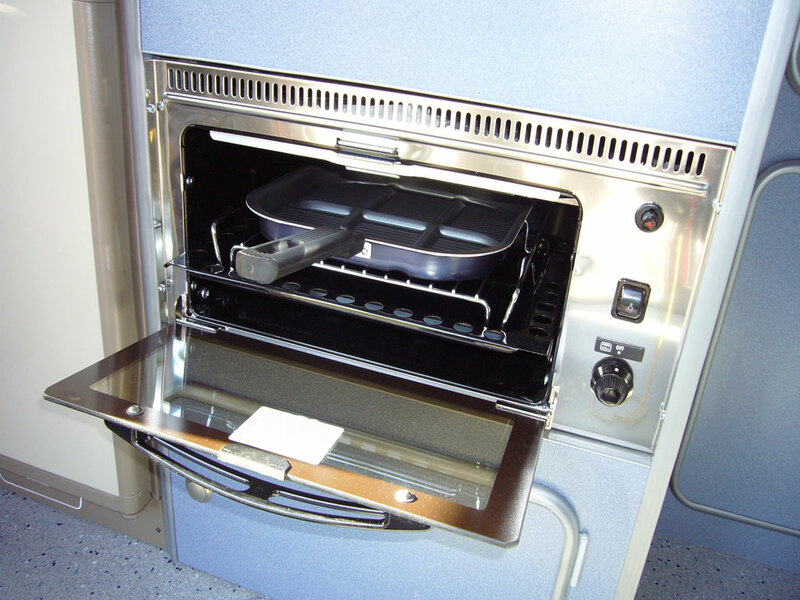 We offer two standard options for a grill in all of our T6 conversions – both are produced by Italian manufacturer SMEV. SMEV mini grill 555 – a full separate grill box with glass fold down front. At 240mm high, 485mm wide and 450mm deep it does take up a fair amount of cupboard storage space. Piezo push click button ignition is standard as is an internal light. • Tiree – the grill can only fit below the sink, but due to its depth the side cupboard units must be 10cm deeper which makes the rear seat 8cm narrower, reducing it down to 112cm wide. • Cromarty – the grill can only fit below the gas hob, with a 47 litre drawer style fridge underneath. This will give you a smaller fridge than our normal 62 litre and also means that you lose the cutlery drawer. 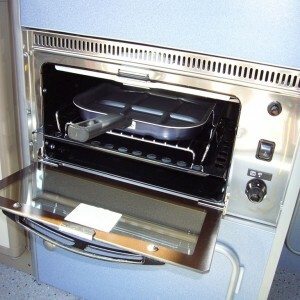 SMEV hob with inbuilt grill – this unit has an open topped two burner hob with an integrated grill built in beneath. Cut into the counter top like a regular hob, we fit a steel sided box on the underside with fold down access door built into our furniture unit. • Tiree – the grill can only fit above our standard 51 litre fridge and means that you lose the cutlery drawer as it becomes the grill box. • Cromarty – the grill can only fit above our standard 62 litre fridge and means that you lose the cutlery drawer as it becomes the grill box. The sink would also change to become a glass topped style with integrated tap. • Sanna & Taransay – the grill would mean a change in sink to a separate one with a glass top and integrated tap towards the rear of the van. • Jura – the grill would mean a change in sink to a separate one with a hardwood chopping board top alongside.